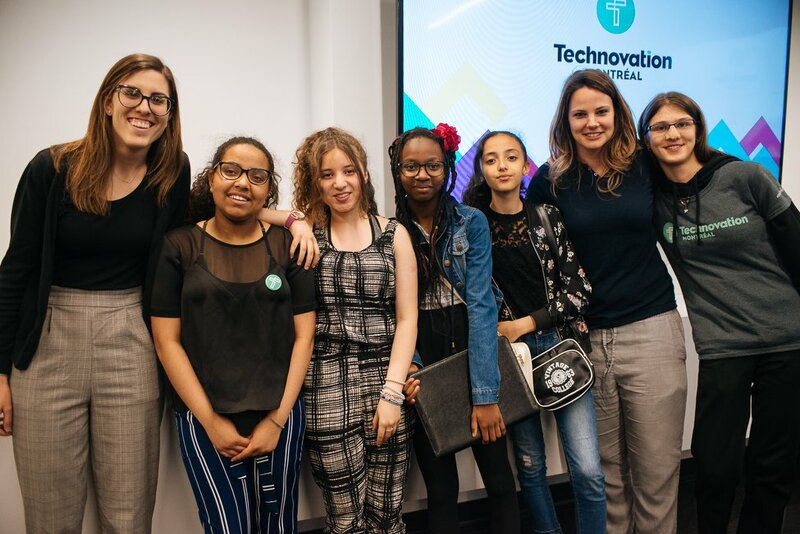 How to better handle everyday tasks, counter bullying, or monitor our medication: these are the mobile app projects that won the heart of this year’s jury at the Technovation Montréal’s regional final on this week, on May 14. For its fourth year in a row, the challenge brought together eleven teams of girls ages 10 to 18 to develop a mobile app that solves a community problem. Among their assignments, they had to produce a business plan, program a prototype, and present their project before a jury or real professionals, including people from Google and Yapouni. On stage, they all successfully introduced the results of six months of work achieved during weekends essentially, with the help of professional mentors. Ambre Lizurey, associate producer, was at the event to encourage Dendros, the team she coached from November to April. Their app helps youth find their professional path through a series of quizes. Alongside the regional final, each team has to submit their project online to enter the Technovation international competition, which takes place in San Francisco in July. The best projects from around the world will be invited to the international final for a new round of presentations. In 2016, two 12-year-old Quebecers qualified to pitch their application, In Da Fridge, which aimed to reduce food waste. Technovation Montréal is one of Ubisoft Codex’s partnerships. With 15 initiatives in collaboration with 20 partners, this program is dedicated to developing Quebec’s future techno-creative generations.